Our family loves The Play School at Arbor Village. As an Early Childhood Educator, not only was I impressed with the amenities in the center, but the curriculum is just as amazing! My children are able to learn through play and structured activities, giving them a balanced day to help them become more successful. But most importantly my children are LOVED! Thank you to the wonderful staff at The Play School. We have been going to The Play School at Arbor Village for over 5 years and they have provided care and education to our children that is well beyond what we expected. The teachers are amazing. They truly partner with us on raising our girls. Whether it be potty training or behavior issues, they have worked with us to find solutions that are best for our family. They listen to our ideas, offer suggestions and take actions we’ve agreed on together to better our children. I’ve witnessed them rocking my sick baby, cheering on my daughter when she’s overcome obstacles and I’ve seen genuine pride in their faces when our daughter graduated pre-school. I never thought a teacher could care for my children that way until I experienced it at the Play School. This is all on top of what they teach my girls every day. They learn so much and have fun doing it. My daughter was well prepared for kindergarten, knowing more than what was expected, thanks to the Play School. Not only do they teach the basics, but they also have interesting weekly lessons that teach the children beyond reading and writing. And they make it hands on and entertaining! As a family ran business, they truly care about our children and our family. They take pride in what they do and it shows. We couldn’t be happier with our decision to send our girls to the Play School at Arbor Village. My son has been going to The Play School since he was 12 weeks old and he's still attending four years later. We've been blessed with knowledgeable and trustworthy teachers in every single room he's been in. As a new mom, it was difficult for me to leave him with strangers but I soon realized he was in the best place in the most kind hands that I ever thought possible. Although I'm excited for my son to start kindergarten next year, I'm sad that we will be leaving our Play School family. Thank you all so much for the good advice you've given me over the years and for helping to shape and mold Dax into the sweet, funny little guy that he is.Thank you for all the hugs and TLC you gave him when he was sick or got a bump or bruise and for being patient when he made some not so good choices. The Play School staff is the best and I recommend them to anyone who wants their child to receive excellent quality care in a loving learning environment. I am so thankful to have my three children be a part of such an authentic, family-like environment each day! My children look forward to starting their days with their teachers and it's difficult to get them to leave at the end of the day. The programs they offer such as music, PE, and Spanish are really beneficial. My oldest daughter knows more Spanish than I do now! As a parent, I really appreciate that the fees for these enrichment programs are already included in the tuition where it would be an additional cost at most other centers we initially considered. Thank you The Play School for taking such amazing care of my three babies! In the last 3.5 years, our family has had such a great experience with the teachers, staff, and owners at The Play School. Each teacher has made a special effort to get to know and understand our child's personality so incredibly well.These close personal relationships with their teachers has helped to build their confidence, and really allow them to thrive. We leave every day without a doubt knowing they are being loved and cared for, and that the staff would go to the end of the earth to keep them safe. And to top it all off, they learn so much! They have spanish class, and music class, and grow gardens, and take nature walks, and so much more! I couldn't dream of duplicating all of these experiences at home. As a working mom I constantly wrestle with the guilt of being away from my child and want only the best for him. I am so grateful for how the teachers and staff at the Play School go above and beyond to provide a loving and educational environment. I can’t say enough about the wonderful teachers and lesson plans that are so engaging my 2 ½ year old comes home talking non-stop about it what he learned. With Spanish, physical education and music enrichment programs and state of the art facilities each day is different and keeps my child engaged and active. 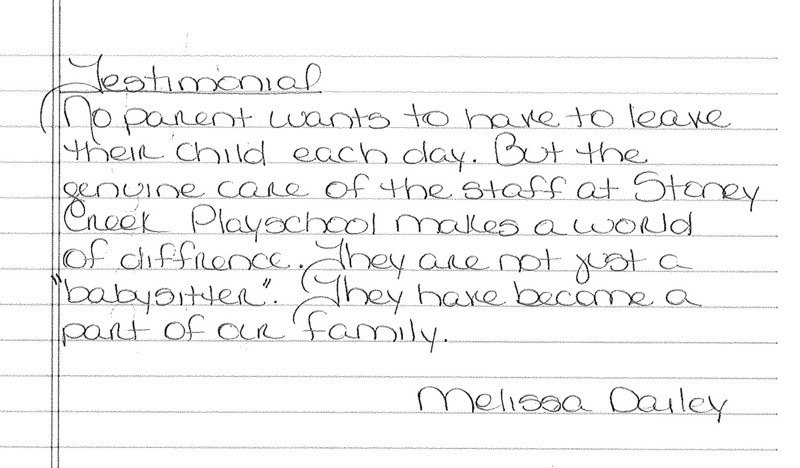 The management and communication stands out from our experience with other daycares. The updates we receive on the Precious Status App help us keep in touch. Classes are never combined and staff is scheduled in 12 hour shifts so we always drop off and pick up to the same person. 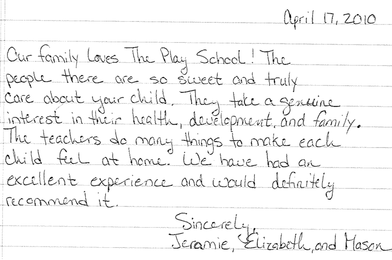 We are extremely happy at the Play School and would highly recommend it! We started sending our first child to The Play School in February of 2008. She was joined by our second child shortly thereafter. It is without question that they truly provide the best care and curriculum of all the daycares we researched before making this big decision. We firmly believe our child is cared for as if they were one of their own children and are continually impressed with every aspect of The Play School! No parent wants to leave their child each day. But the genuine care of the staff at the Play School makes a world of difference. They are not just a “babysitter.” They have become a part of our family. 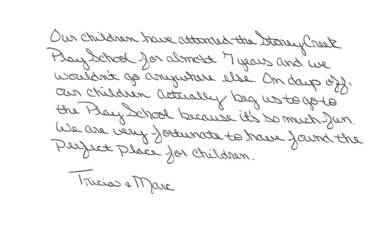 Our children have attended The Play School for almost 7 years and we wouldn’t go anywhere else. On days off, our children actually beg us to go to The Play School because it’s so much fun. We are very fortunate to have found the perfect place for children. We feel privileged to have depended on The Play School to care for our 3 daughters for over 10 years. The turnover is low (our 4 year old has the same teacher that her 10 year old sister had! ), the staff and administration genuinely care about our children and they provide a fun, safe learning environment. Our daughters like it too, and this is the #1 reason that we’ve stayed with Stoney Creek for over a decade! Our son was almost 2 when we started him at The Play School. We had looked at several other daycares before we chose The Play School. What we loved is that there is a feeling of family there. The teachers and management truly care about each and every kid. A lot of the teachers have been employed there for years which says a lot about the facility. Our son is in kindergarten now and still attends and will go in the summer. He loves it and it is a great feeling for a parent to know your child is in good hands and is safe and is learning. I would recommend this facility to anyone. I don’t think you will find many daycare facilities that put forth the effort and treat your child with such care. Our experience has been a great one. Our family loves The Play School! The people there are so sweet and truly care about your child. They take a genuine interest in their health, development and family. The teachers do many things to make each child feel at home. We have had an excellent experience and would definitely recommend it. The Play School has been a wonderful environment for our son to learn and grow developmentally. Since I am a teacher within Hamilton Southeastern Schools, it was imperative for me to find an engaging and loving learning environment. We have been a part of the Saxony family since it opened 3 1/2 years ago and have recommended The Play School to many of our friends and colleagues in the area. I have been a teacher nearly 10 years and have never experienced such a child-focused environment as I do when I walk into The Play School. I never feel, as a parent, that anyone at The Play School treats it as a business; everyone is clearly there for the kids. I feel like the tuition and the annual supply fee is used 100% on the children. The amount of craft supplies, toys, books and other items that my child has access to at The Play School...I feel like we get more than a return on our investment. The Play School is the only viable substitute for staying home with my son. When we walk in, every teacher greets him by name and he knows so many of the children by name, it proves to me that he's being treated like a member of a family. The development of my son's personality, confidence and creativity since he started attending The Play School has been a gift. I cannot imagine how different he would be if he were not able to enter such a child-focused environment every day. I hear stories from mothers I work with on how their children are treated and the lack of programs at other franchise schools in our area, and these mothers are paying hundreds of dollars more a month than we are! I feel so very lucky to have my son at The Play School! When I left work a few weeks ago to have lunch with my son during "The Week of the Young Child" celebration, so many other parents were jealous because the "name brand" preschools in our area do not promote parent involvement like The Play School does. My son knew he attended the best preschool because he not only got to dress up every day, but he also wore pajamas to school and Ms. Rita (the owner) bought every child a ball, too! When you're 3 years old, that's love! I have seen sides of my son's personality and creativity that I would never have known existed unless he was at The Play School! He brings home so many craft projects and can explain the rationale behind each one so well that it's truly impressive. The weekly themes really help him learn and it's exciting as a parent to know what he is learning and to reinforce it at home. 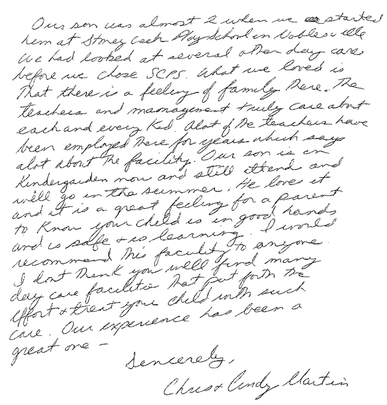 The communication from his teachers and the administrative team make that possible. Being a first time Mom and Dad and having our daughter attend The Play School has been a great peace of mind while we are at work! I have had my girls at Saxony Play School since the day it opened. Both of my girls go there and love it and I love the school, the director, the owners, and most importantly---the teachers. It is easy to tell that they are selected and retained for their love for children and their terrific personalities and dedication to education and comforting the children. I feel good dropping them off each day, since I know they are in good hands. A year ago I was a stay at home mother of 5, and thought I would NEVER leave my children with anyone but my mom. I need to add that even she couldn’t handle my gang longer than 1 hour and 55 minutes. But an opportunity arose for me to return to college and continue with my goal of becoming a nurse. I knew that I could not pass it up so I luckily had run into another mother that was working at the nearby YMCA. Now I need to tell you that after being with only children all day for the past 5 years I found myself befriending any adult that approached me. (Pretty desperate for some adult conversation you might say!) Well my newest friend told me she was a single mother, had recently moved here from Seattle, Washington, and she had a son that was 1 ½. I had mentioned how lucky she was to have day care at her job. I told her how I had lived in Fishers for 5 years and had not visited a daycare yet that I would completely trust with my children. To my surprise she told me she didn’t trust the people in there to watch him all day and her son went to a daycare in Noblesville. Since I was losing hope for finding a place that I trusted to take care of my kids I thought I would give it one more try. I set a time to meet with Amanda (the director at that time). When I got there I was greeted, given information, and shown around the school. Now I think that every time you first visit a daycare they put their best foot forward, but I just had a feeling that this wasn’t the case…it was a truly friendly, caring, clean environment! I can tell you that the Duncans have been going to The Play School for almost a year and there is never a day that I regret choosing the wonderful women, and Brad, at THE PLAY SCHOOL in helping me raise my children. It sounds funny to put it that way, but when I think about it Monday through Friday I only see my children as I am getting them ready and into the car to go to school. Then not until it is almost dinner time, we have an hour of fun together, and then bath and bed. Although I treasure every minute with my kids, I do realize that most of their day is spent with the staff at The Play School. I could never thank everyone that’s at The Play School enough…..Amanda, Rita, Kelly, Brad, Sarah, Beth, Linda, Lisa, Annette, Kelly O., Terri, Jenni, Emilee, Natalie, Sharon, Linda, Ken, and Frank! Jeremy, Bridgette, Taylor, Savannah, Ian, Izabella, and Kaleb! My family and I love The Play School. Both of my children love their teachers and light up when they see them. I know that I am leaving my children in good hands when I leave them there every day. A few years ago we enrolled our children at The Play School at Saxony Village because of the learning curriculum and proximity to our home. Over the years we've grown to personally learn and care about our children's teachers and the Play School staff as friends of ours. The staff turnover is very low and therefore helps build relationships with the childen and parents. We have, and will continue, to highly recommend The Play School to our friends.